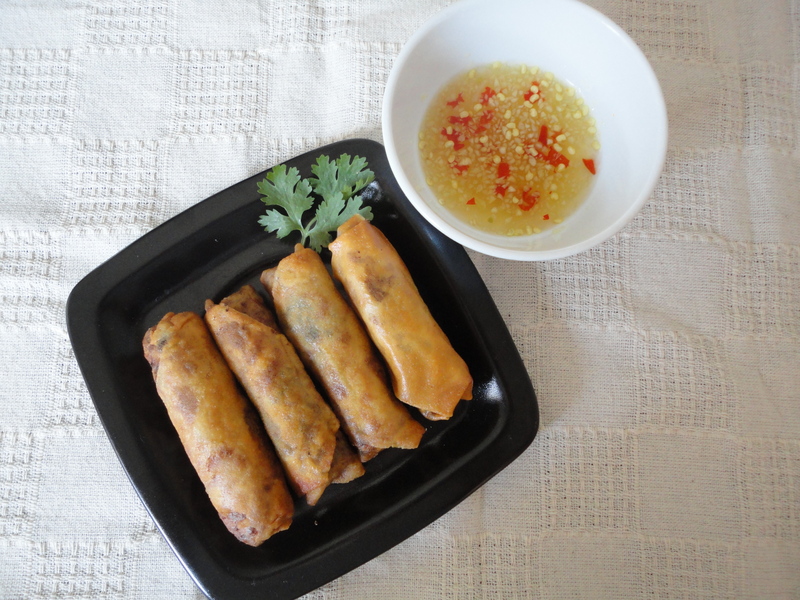 But here I am today, making spring rolls, more to satisfy my constant craving for a bowl of vermicelli filled with fresh herbs, crispy spring rolls and a tangy dipping sauce than a desire to test whether my patience has improved over the years. 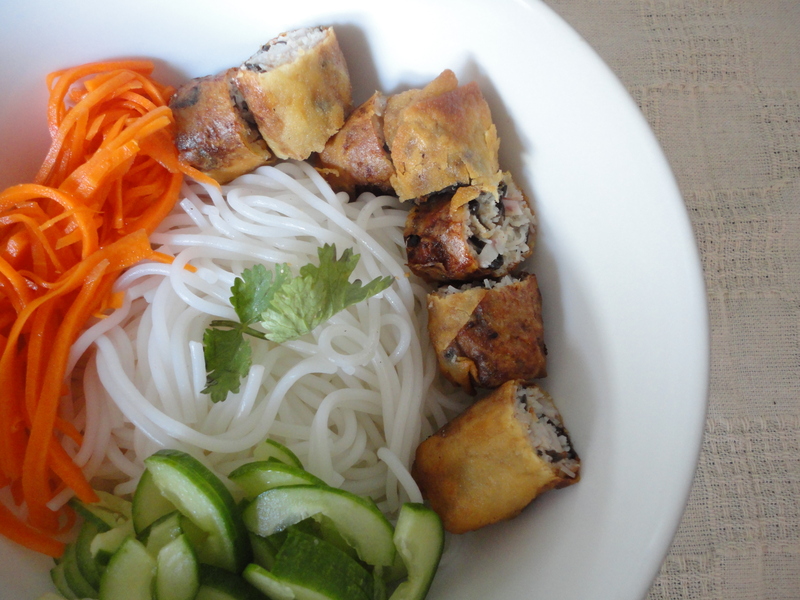 My mom was always the one craving for spring rolls, at which point she would go to the market shopping happily for all the ingredients and laid everything out before me and my aunts like we automatically knew what to do next. And we did. I ran the errands around, Cô Y complained about the mess while making the dipping sauce, Sáu Hạnh julienned yam and peel the prawns. Familiar? My favorite part of all was when we finished all the ground work and started wrapping the spring rolls. My sole job was to separate the wrappers so Sáu Hạnh or my mom could do the wrapping (it was an important task ok? They tend to stick together, you don’t want to break them apart). My mom and Sáu Hạnh would spread out the wrapper, put on a tablespoon or so of filling, and rolled the whole thing into a nice tightly wrap of goodness. I watched them work like a little kid fascinated by soap bubbles. Wrappers laid out, filling scooped, sides folded, ready, set, roll. The end result? A line of uniform spring rolls lying peacefully on a big plate waiting to be fried. I remember burning my tongue just to get a bite of the just-one-minute-out-of-the-pan spring roll. It was worth it. Coarsely pulse the prawn in a food processor or pound them with a pestle and mortar. 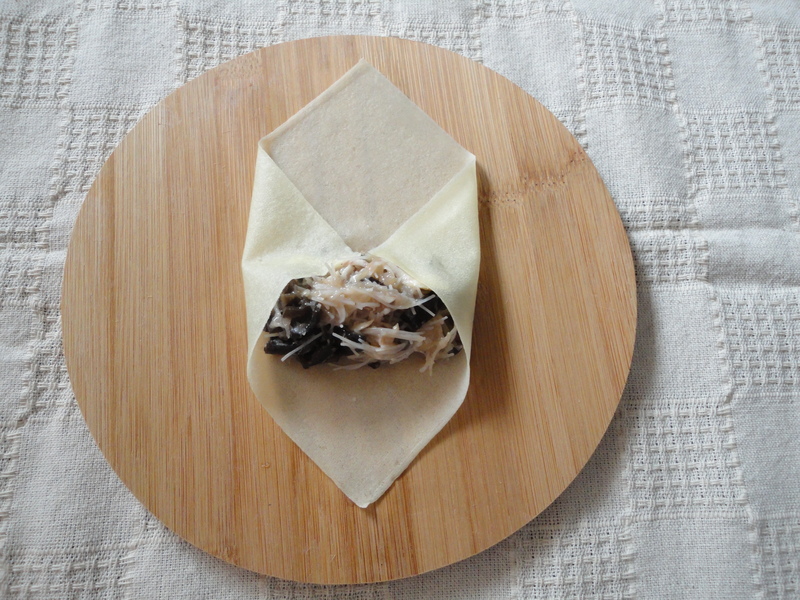 The point is not to overdo so you can taste different textures in the filling. Combine all other filling ingredients thoroughly, season with 2 tsp of sugar, 1 ½ tsp of salt, 1 tsp of fish salt, a good amount of ground pepper. Mix in the prawn last and gently combine with the rest. Let the filling rest for an hour before wrapping. My first few pieces were usually uneven (too much or too little filling, not tight enough), but once my hands get used to the rhythm, the spring rolls also get a tiny bit better. Still, my aunt and my mom are the best at producing spring rolls that taste like home and look like factory-made. Lastly, heat up the oil until when you stick in a chopstick and see small bubble around the end. The oil should cover 3/4 of the spring rolls. Fry until the color turns golden brown. I know the majority of Vietnamese spring rolls are made with the translucent type of rice paper but after trying many times, our family switched to these wrappers as they absorb less oil and remain crispy longer. Fancy a seafood flavor? You’re welcome to mix in crab meat, it’s best to keep it in chunks, yummy! Finally, I can enjoy my bowl of goodness. < Previous From itchy feet to a happy stomach – Myanmar – Part II: Street Food!